Custom Cabinetry, Kitchen Cabinets, Bath Cabinets, Office Cabinets And Entertainment Centers Cabinets, Cabinet Design - Karst Builders, Inc.
Karst Builders has its own custom cabinetry shop. 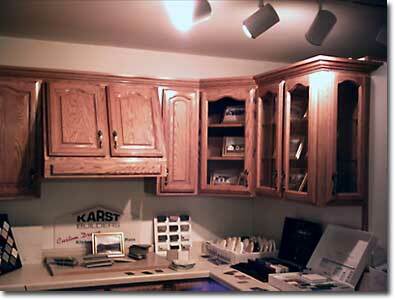 We have been building cabinets for 26 years and it has become an integral part of our business. We hold ourselves to extreme high standards when building, sanding, staining, finishing and installing our custom cabinets. Karst Builders also installs our own custom cabinetry in all of our new construction homes and/or remodeling projects. The cost of our cabinets is very competitive to local "Big Box" retailers. We can match just about any style or finish, and we use only the highest quality materials to build our cabinets. Karst Builders builds Kitchen cabinets, Gun Cabinets (to you specs), Bathroom Cabinets and Vanities, Entertainment System Cabinets, Cabinets for Commercial and Residential, in addition to any other cabinet you might need. Contact us for all your current and future custom cabinetry needs.